Ductable up to 6m and supplied with a mounting bracket. Aventa 100mm in-line mixed flow fans are available in high-performance two speed versions. They are less bulky than large in-line centrifugal fans and can be installed in loft spaces or service shafts. EMCOVENT SHOWER FAN KIT WITH LIGHT 100MM (4") WHITE INC. TRANSFORMER FOR LIGHT!! BY EMCOVENT. OCCUPANCY DETECTOR (PIR). 100MM (4"). IN LINE SHOWER FAN KIT. THIS SHOWER FAN KIT IS DESIGNED. A SHOWER CUBICLE. YOU CAN CONVERT THE LIGHT PART TO L.E.D. IF YOU CHOOSE TO DO SO BY INSTALLING AN L.E.D. DRIVER AND. 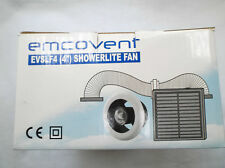 4.5 out of 5 stars - EMCOVENT SHOWER FAN KIT WITH LIGHT 100MM (4") WHITE INC. TRANSFORMER FOR LIGHT!! 2 product ratings2 product ratings - EMCOVENT SHOWER FAN KIT WITH LIGHT 100MM (4") WHITE INC. TRANSFORMER FOR LIGHT!! And will extract through ducting up to 10m long. 1xMixed Flow Fan. Powerful, yet quiet and unobtrusive, the SCF200T has an extract rate of 110m3/hr 31 litres per second. 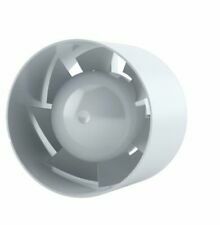 Compatible with Ø100mm round air ducts. ST100 - 110 m3/h. NOISE LEVEL 35 dBA @ 3m - ST100. A dynamic balanced impeller with backward curved blades balanced in two planes. Overheating protection with automatic restart. Vent-Axia 17104020 ACM100T 100mm In-Line Mixed Flow Fan. Condition is Used. Dispatched with Royal Mail 1st Class. Aventa 100B is a mixed flow fan. Quiet and powerful, high performance up to 187 m3/hr. Ductable up to 6m and supplied with a mounting bracket. Aventa 100mm in-line mixed flow fans are available in high-performance two speed versions. Manrose MF Timer Std Mixedflow Back Draught Bathroom inline Fan Kit 4" 5" 6"
Vent Axia ACM100 In-line Mixed Flow Bathroom Extractor Fan 100mm 4"
Oil Filled Radiators. Two speed selectable motor. 6242Y Twin & Earth. Door Entry Systems. Wall Lights - Exterior Surface. Direct On Line Motor Starters. Fire Protection. Quick and easy installation. Light Bulbs. Light Fittings. Modular Office Lighting. 12way PVC Strip Connectors. Lighting Sensors. Insulated Cable Glands. Cable Connector Link Boxes. Wago Cable Accessories. Motor Capacitors. Star Delta Starters. Direct On Line Motor Starters. Internal Grilles & Outlets. Wall & Ceiling Bulkhead Lights. Hand Wash Units. Air Conditioning Units. Cable Accessories. Powerful 137m3 per hour extraction rate. LED warm white illumination. 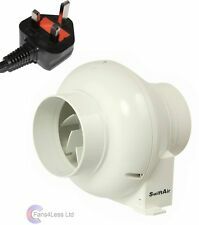 HIB Turbo White Bathroom Inline Fan - 33500. Installing an effective ventilation system is essential if you want to prevent damp and mould in the bathroom. HIB have a collection of sleek, modern and stylish extractor fans with functional appeal to the overall bathroom. The CFD200TN can move air over long distances and will give maximum performance even against pressures caused by long lengths of ducting and resistance by grilles. CFD200TN In-Line Centrifugal Fan. Fan Speed: 1400 RPM. The CFD200TN can move air over long distances and will give maximum performance even against pressures caused by long lengths of ducting and resistance by grilles. CFD200TN In-Line Centrifugal Fan. LED Strip & Drivers. Monsoon UMD100T Mixed Flow In Line Extractor Fan with Timer 100mm / 4"
Monsoon UMD100T 4" In Line Mixed Flow Extractor Fan with Timer High quality unit which can be used for extraction and intake ventilation systems that require high pressure, powerful airflow with low noise levels. 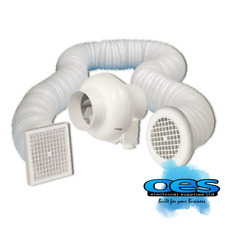 Ideal solution for ventilation of rooms with high humidity such as bathrooms, kitchens, as well as ventilation for apartments, houses, shops, cafes and hydroponics situations etc. This model incorporates a run on timer which operates in conjunction with the room light switch. When the light is switched on the fan starts, when the room light is switched off the fan continues to run for a pre-set time (adjustable 2 - 30 mins). Motor: The single phase ball bearing motor is equipped with Standard Thermal Overload Protection (STOP) with automatic reset. Motor protection. Cable Accessories. Wago Cable Accessories. Insulated Cable Glands. 6491X Singles Cable. Armoured Cable. Oil Free Radiators. Oil Filled Radiators. 6242Y Twin & Earth. The CFD series is suitable for a wide range of applications includingbathrooms, toilets, shower rooms and utility rooms.The CFD series is fitted with backward curved centrifugal impellers fora large airflow against the high pressures caused by longer lengths ofducting and resistance by grilles. 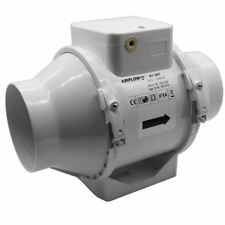 The CFD series is fitted with backward curved centrifugal impellers for a large airflow against the high pressures caused by longer lengths of ducting and resistance by grilles. Available with mounting bracket. Xpelair XIL100T 4" 100mm inline extractor fan kit. We will always help you to have a 100% positive happy buying experience. Ideal for use in bathrooms, showers, toilets and kitchens. Model: UMD100T. With a range of sizes that include 100, 125, 150, 200, 250 and 315mm the UMD can be used with rigid and flexible ducting. The single phase ball bearing motor has two speeds and is equipped with Standard Thermal Overload Protection (STOP) with automatic restart. Lineo Mixed Flow In Line Extract Fan. 550m3/hr (152.8l/s)(high). IPX4 (splashproof). 50.5dB(A). Lineo series extractors have a very small overall size, making them ideal for installation in cramped areas. Monsoon UMD150 Mixed Flow In Line Extractor Fan 150mm / 6"
Monsoon UMD150 6" In Line Mixed Flow Extractor Fan (Non Timer) High quality unit which can be used for extraction and intake ventilation systems that require high pressure, powerful airflow with low noise levels. Ideal solution for ventilation of rooms with high humidity such as bathrooms, kitchens, as well as ventilation for apartments, houses, shops, cafes and hydroponics situations etc. Motor:​ The single phase ball bearing motor is equipped with Standard Thermal Overload Protection (STOP) with automatic reset. Motor protection rating IPX4. Complies with Part F building regulations and designed for ambient temperatures up to 60°. Supply voltage 220-240v 50Hz. Designed especially for installation in shower cubicles. Also ideal for bathrooms, toilets, kitchens etc. High quality British made fan. We will always help you to have a 100% positive happy buying experience. Monsoon UMD125 Mixed Flow In Line Extractor Fan 125mm / 5"
Monsoon UMD125 Mixed Flow In Line Extractor Fan 125mm / 5". Condition is New. Dispatched with Royal Mail 2nd Class. Type Inline. Light Fittings. Light Bulbs & Tubes. Supplied with convenient installation mounting cradle. Lubricated for life, maintenance free motors with thermal cut-out protection. When we notify you of the estimated arrival date you will be able to decide whether or not to proceed with the order. MPN 17104020. Optimise fan performance by using an approved Vent Axia. All motors are fitted with Standard Thermal Overload Protection. (S.T.O.P.). There is an adjustable minimum speed setting. Vent-Axia has designed a complete range of Mixed Flow In-Line fans that are now quieter than any other product on the market. RDL EC12 4" 100mm inline extractor fan kit. Kit Includes 1 x outlet grille. We will always help you to have a 100% positive happy buying experience. New, unsed and in original box, clearance item. Aventa AV100 100mm – Mixed flow in-line fan 2 speed Quiet and powerful, high performance up to 187 m3/hr. Ductable up to 6m and supplied with a mounting bracket. Humidistat available: Electronic Humidstat ON/OFF (30-90%) Aventa 100mm in-line mixed flow fans are available in high-performance two speed versions. MPN SF100T. Designed for the safe ventilation of bathrooms, toilets and shower rooms, the SF 100 (100mm 4") is 85m³/hr 23 litres per second. The units are all manufactured using high impact ABS thermoplastics for strength and durability, aesthetics and easy cleaning. Vent-Axia ACM100 In-Line Mixed Flow Fan. It has a seperate footplate for simple location mounting and detachable spigots for easy connection to ducting. The motor body chassis rotates to provide easy connection in acute spaces. The Manrose In-Line Shower Fan Kit is designed for the safe ventilation of bathrooms, toilets and shower rooms. Quiet and efficient, the FD100S has an extract rate of 85m³/hr (23 ltr/sec). The single phase ball bearing motor has two speeds and is equipped with Standard Thermal Overload Protection (STOP) with automatic restart. The fan can be mounted in line or at either end of the duct run and at any angle, horizontally or vertically. The Manrose In-Line Shower Fan Kit is designed for the safe ventilation of bathrooms, toilets and shower rooms. Door Entry Systems. Wall Lights - Exterior Surface. Direct On Line Motor Starters. Fire Protection. Star Delta Starters. Decking & Ground Uplights. Air Conditioning Units. Air Curtains. REMOVED FROM ITS BOX BUT NEVER INSTALLED. Vent Axia ACM100T In-line Mixed Flow Duct Fan & Overrun Timer Bathroom 100mm 4"
Direct On Line Motor Starters. Fire Protection. Quick and easy installation. Star Delta Starters. Decking & Ground Uplights. Air Conditioning Units. Air Curtains. Westinghouse Light Kits. Aventa 100T is a mixed flow fan. Quiet and powerful, high performance up to 187 m3/hr. Ductable up to 6m and supplied with a mounting bracket. Aventa 100mm in-line mixed flow fans are available in high-performance two speed versions. 100mm Inline Extractor Fan. Perfect for tents by mounting in tent pockets. Quiet running axial flow impeller. Protection class: IP-X2. Pressure: 34Pa. Consumption: 15W. The units are all manufactured using high impact ABS thermoplastics for strength and durability, aesthetics and easy cleaning. Colour White. Fan Size 4" 100mm. Extraction Rate Cubed Per Hour 85m Cubed /hr. High power extractor fan that fits Standard 100 mm or 4 " solid or flexible ducting. Our in line mixed flow extractor fan can be loft mounted and is perfect for long duct runs. Up to 187 m3/hour extract airflow rate with a high pressure mixed flow impeller.